LONG-TIME Standard Chartered banker Lim Cheng Teck has made a career out of creating history. 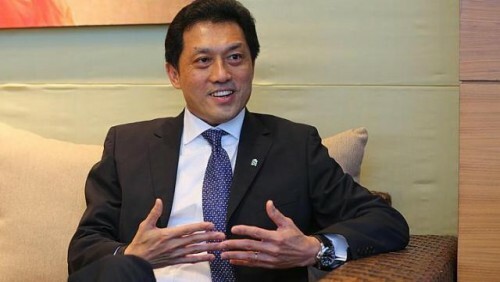 He was only the third Singaporean - and the first male - to be made a chief executive of StanChart's Singapore unit, when he was appointed to the top role of the bank's Singapore business in 2006. Two Singaporean women - Ms Euleen Goh and Ms Theresa Foo - had previously held that role. Mr Lim, 53, followed that up by taking on the role of the bank's China chief executive officer in 2009, and then became the first born and bred Singaporean to be appointed a regional chief executive for the bank. That milestone came at the start of this month when Mr Lim was appointed chief executive for StanChart's Asean region. The veteran banker - he has been with the British-based bank for 26 years - said he has had many valuable mentors, including his predecessors and former StanChart Singapore chief executives Euleen Goh and Theresa Foo. "My career mentors and seniors encouraged me to try new experiences, learn new skills. "They told me that you do not know what you do not know and it opened me to a completely different world, and that prepared me to be in a better position to be effective in the role to be a CEO." He hopes to be a good role model for other Singaporean employees at the bank, creating an environment that allows his staff to be the best that they can be. Mr Lim, who started his career at United Overseas Bank, left the local lender after two years to gain international experience with StanChart and has never looked back. He is credited with leading its China business unit in doubling its revenue from 2009 to 2012, including crossing the US$1 billion (S$1.25 billion) mark for the first time. Mr Lim also doubled the bank's branch footprint there. He has now set his sights on expanding StanChart in South-east Asia, one of the bank's eight geographical regions. "If you look at Asean today, collectively, the 10 countries are the third-largest economy in Asia; it's a US$2 trillion economy. There're 600 million people - a huge market for investment and consumption." Including StanChart's 44.5 per cent stake in Indonesian bank Permata, Asean accounts for some 25 per cent of StanChart's group income, with the bank hiring about 30,000 people across the region. StanChart is targeting three market segments: corporate and institutional clients, retail consumers including high net worth individuals, as well as commercial customers. "I see tremendous opportunities in the commercial clients, particularly in Asean because Asean economies are starting now to build their own entrepreneurship and businesses," said Mr Lim. Despite occasional political crises in the region, such as the prolonged protests in Thailand, Mr Lim sees much potential for growth. He noted that Indonesia and Vietnam are benefiting from the spillover effect from China, with some manufacturing activity moving to these lower cost centres as China becomes more expensive. Mr Lim said he is not opposed to bulking up through mergers and acquisitions to grow the South-east Asian business, though the bank believes that organic growth creates the most shareholder value. "We are not closed to capability or capacity type of acquisitions. So if you look at us over the last few years, we have made a number of acquisitions," he said. Singapore is at the core of the bank's strategy to boost its growth in Asean. It now hires around 7,400 staff here, of whom about three-quarters are Singaporeans and permanent residents. Said Mr Lim: "We see Singapore playing a critical role. Singapore is the financial hub for the region, a commodity trading hub, a logistics hub for the region."